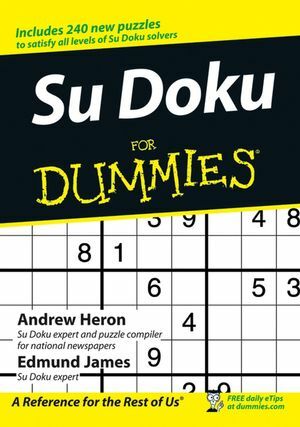 Su Doku For Dummies offers more puzzles than any other book available. This guide is perfect for newcomers to Su Doku as well as experienced Su Doku players looking to improve their game and addicts who just can't get enough new puzzles!!! Su Doku (or Sudoku) has been dubbed the Rubik's Cube of the 21st century, it’s a cryptic and highly addictive puzzle that involves inserting numbers in a 9x9 grid and making sure that every row and every column and every 3x3 box within the bigger grid contains all the digits from one to nine. All it takes is the ability to identify the numerals 1-9, a sense for logic, a methodical cast of mind and a large measure of application to boot. You can get better and quicker, if you put your mind to it. And there is no predicting who will excel: you can be a disaster at maths and a whiz at Su Doku! Andrew Heron and Edmund James are Su Doku experts and puzzle compilers for national newspapers across the world. PART I: SU DOKU STRATEGY. Chapter 1. Simplifying Su Doku. Chapter 2. Taking Su Doku Up a Notch. PART II: SU DOKU PUZZLEMANIA. PART III: THE ANSWER TO YOU PROBLEMS. Want to know what all this Sudoku fuss is about? Try out these three FREE Sudoku puzzles; after you get hooked like everyone else, check our other Sudoku puzzle books, which contain hundreds of addictive puzzles, plus plenty of advice for becoming a Sudoku master. 1. Each column, each row, and each box must contain each of the numbers 1 to 9. 2. Therefore, no column, row, or box can contain two squares with the same number.